Formula One has been going through a fallow patch for the past few years when it comes to videogames. There had been an annual game since 1996 but that all changed in 2007 on the expiry of Sony's five-year contract to produce the official F1 game. Negotiations between F1 boss Bernie Ecclestone and Sony ensued but came to nothing as sources suggested that he was "playing hardball" over the fee. Given that Sony was already paying $15m annually for the license it is easy to see why they walked away. British firm Codemasters picked up the license in 2008 and Pitpass' business editor Chris Sylt has been given an exclusive presentation of its efforts which will truly rev up the franchise. F1 lacked a new game in 2008 but late last year Codemasters' first F1 product was released. The game appeared on the lower-specification portable PlayStation and Nintendo consoles with the higher-specification Microsoft Xbox 360 and PlayStation 3 consoles having to wait for their editions due to the greater input required. From what Sylt has seen of the 360 and PlayStation 3 versions they will be well worth the wait. As Codemasters' communications manager Andy Gray reminds us, F1 itself is not even broadcast in high definition so the very fact alone that the new game has been created from the ground-up to play in HD is an impressive feat in F1 terms. In motion the game is silky smooth and pin-sharp. Gone are the days of chasing a black and white dot around a screen. The cars are now built digitally with the separate components which comprise their real-life counterparts. Accordingly, suspension parts move realistically since they are doing the same job as they would on a real track with a programme replicating the actual laws of physics. The track is just as much of a star as the cars. The camera shakes as cars whizz by and when they end up in a gravel trap it leaves wheel impressions which stay there for the duration of the race and affect grip. As other cars drive past the area dust disperses and can even be seen blowing in the wind. Gray says that a unique weather system has been developed to accurately mimic F1 race conditions so after a downpour, certain parts of the circuit will dry quicker than others. So impressive is the effect that it has been built into the programme (known as the 'Ego engine') which Codemasters uses as the core of all the racing games in its stable including the acclaimed Colin McRae rally series. However perhaps the most unique aspect of the new F1 game is its 'career' mode. In addition to a feature which allows game players to pick any driver and any track for a quick spin, the career mode places players in the shoes of an unnamed rookie to work his way up the grid. It is part of Codemasters' aim to make the game reflect the lifestyle of being a driver and the detail which it has gone to is remarkable. 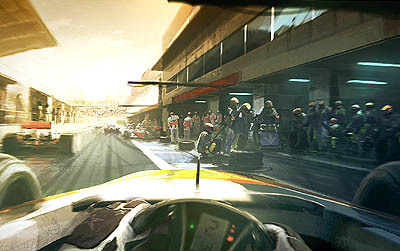 After every race in the career mode, players can control their driver who walks around a digital paddock passing F1's drivers whose faces have been scanned in from photographs according to Gray. If you guide your driver towards the hordes of press you will hear the voice of none other than BBC's David Croft who asks how you performed on track whilst the post-race press conference is voiced by his colleague Holly Samos. However, if you prefer not being hassled by the media you can head into your team's motorhome for a chat with your manager and this is where the game gets really interesting. Gray says that to move up the ranks other teams may give your driver challenges such as lapping a circuit under a certain time or beating a certain driver in a specific race. However, don't expect to be chatting with Anthony Hamilton if you end up at McLaren since Gray says that the driver managers are generic characters. Don't expect to be getting into financial negotiations with sponsors either as Gray says that the on-car logos have to stay the same for contractual reasons. Force India accounts reveal "uncertainty"
World driver rankings? What a Champion idea!